© 2018 LoveRenaissance and Interscope Records. All rights reserved. A few months ago, when 6lack dropped the single “Switch”, I went from fan to Stan. I’d heard a few tracks before and the vibe was good, but I wasn’t on the edge of my seat for his next release. Now don’t take to mean that this was his first good song, if anything it was more a matter of finding a track that connected me with the artist. With Rihanna that track was “Consideration”, with Gnarls Barkley it was “Going On”, and now with 6lack, it’s “Switch”. These tracks make me want to listen to the artist’s fill catalog for songs that I may have missed. With so much music coming out, it is easy to miss a track here or there, and the next thing you know, you haven’t heard your new favorite song. “Unfair”: Remember when Auto-Tune was being overused and everyone hated it? It had more to do with how people were using it and not the feature itself, at least in my opinion. Hearing 6lack use it on the chorus, to give us a dreamscape effect shows how someone can use Auto-Tune to add levels to a song and not just to “correct” vocals (or in the case of T-Pain, hide their actual good voice). “Loaded Gun”: Bizness Boi produced a solid track here, and 6lack knew how to use it. In the first verse, he changes his flow to match the beat change at the line “Got this pretty brown-brown, watch her go wild” then jumps into his rapper flow after a few bars. This is what I was explaining regarding how you can stick out in the modern R&B and hip-hop climate. Since a lot of the music sounds out there the same (either because the producers are hot and people want to work with them or the copycats are out in numbers and no one really cares that Kid X sounds like Producer Y) your skill is what bring you to the top. 6lack can rap, he has the skills and the voice, he understands and can make a song with multiple flows work, and along with “Loaded Gun” he does it again on “Pretty Little Fears” with J.Cole. “East Atlanta Love Letter”: I like this song, and as much as the downtempo can play with your head (depending on where you are personally) no matter what, this is a good joint. The energy on this one is low. If “Unfair” brought me to the dreamscape, then “East Atlanta Love Letter” is riding the wave into a numb place. Sometimes, you need a track like this. You might need it to just level out or help you think. It’s the type of track that you can play on a loop in the background and meditate along to (well I can, I don’t know about y’all). Melodic 6lack & Future (who I never really loved but I can’t pretend isn’t talented) combo chorus delivery… it was bound to be a good track. “Let Her Go”: Next time you are in a relationship and you aren’t sure if the person is right for you, if this is the life you want or need… DO NOT listen to this song. This song brought me back to being 21, dating someone I loved but being terrified of a lifelong commitment. Songs like this are great for reminiscing on younger days and the wild anxiety of love, but I def can’t imagine hearing it while actually trying to make the decision. 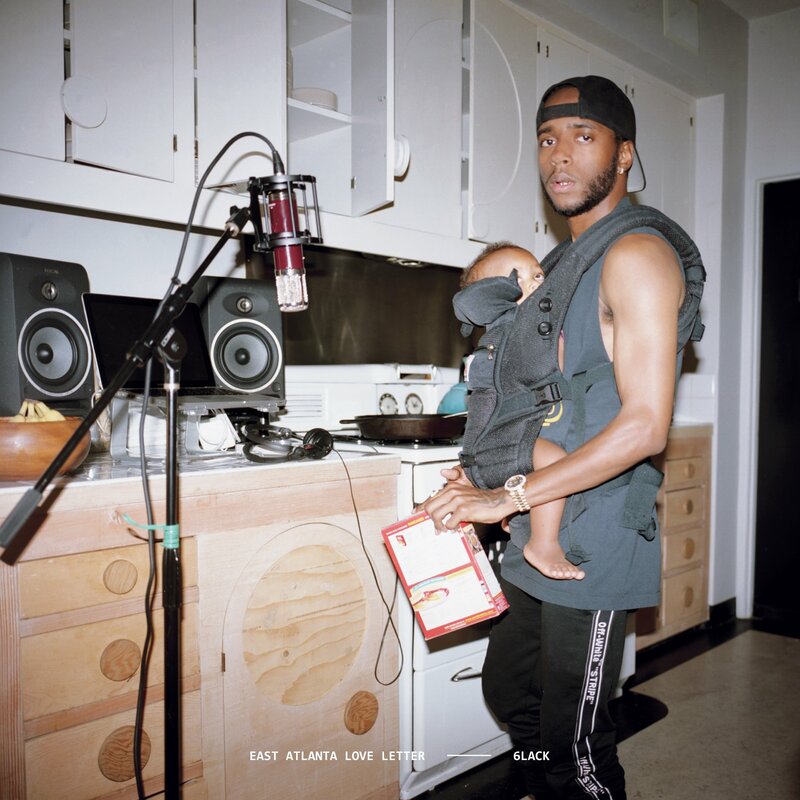 6lack might be too connected to his emotion on this one for our own good. “Sorry”: The following song continues the tale of love and uncertainty. The whole album discusses the theme of love, and being in love, and being young and in love, and never being sure of being in love… and this song is the apology. 6lack got into our collective minds and pulled out all the emotions that came from being scared and making questionable decisions and put them to music. Making this song a beautiful yet painful one to hear. I’ve been on both ends of this, saying sorry for not knowing myself and hurting someone and being the one someone crushed because they didn’t know what they wanted. “Pretty Little Fears”: I can’t express how much I like this song. I’m not sure how to put it down on “paper”. T-Minus (Canadian for those who don’t know) produced “Swimming Pools” by Kendrick, “HYFR” by Drake and those are just 2 hits from his long list of credits. He is a talented producer with the skill to produce sans signature. I am as impressed with producers who have tracks that don’t sound the same as I am with producers who have a unique sound that is never repetitive. T-Minus is one of the best in his lane. When I initially heard the track, I respected the sounds and then to top it off it features J.Cole… I mean, I will say it again, I don’t know how to tell you it’s good. At the end of the day, you have to decide if a good producer working with great vocalist and rapper is the right music for you. “Disconnect”: The production of this track is so on-the-nose with the signal sounds at the beginning, that I was originally annoyed with it (as if I couldn’t get what they were going for), but then the song starts, and you get it. Piano, bass, with signal sounds blended over it. I’ve heard of stripping down the sound for vocals to stick out, but this track took it further. 6lack is really making sure you are hearing the lyrics. “Switch”: The downtempo, minimal production R&B sound that has become the norm just sounds better in the hands of 6lack and his team. The key to the genre is lyrics and solid vocals, something 6lack found when he made “Switch”. Minimalism isn’t a word I commonly associate with hip-hop or R&B, but I think I’ve been convinced that it can work. I love that 6lack then adds “Thugger’s Interlude” to directly address the downtempo vibe on the album. Pretty much ragging on himself for loving the heavier music but producing the downtempo tracks. ‘Cause what is an album about love without addressing choice and decisions? “Balenciaga Challenge”: We did finally get a song I didn’t love. I get the interlude before this was setting me up for a heavier, more rap inspired track, but I didn’t want one. I liked the slow, type R&B he was making. This track felt like he wanted to remind people he can keep up with the rap game when no one is questioning his skills. Offset from Migos is on it and does a solid job. The two of them have a good flow. I mean, some may love it more but in the context of a concept album discussing relationships, I didn’t need it and he didn’t need to prove anything. “Scripture”: I was listening to a podcast recently that brought up that 6lack used to rap and that he manages to take advantage of lyricist skills with a vocalist delivery. I think this is the best example of it. If “Balenciaga Challenge” was the rap track I didn’t need on the album, “Scripture” is the rap track I want on the album. “Seasons”: …Which made hearing Khalid on “Seasons” a nice surprise. Dave Bayley from Glass Animals on production, 6lack and Khalid on the track. Two gifted singers blessing the penultimate track, setting us up for a home run of a finale. “Stan”: At first, I wasn’t sure why you would want to evoke the idea of a Stan. Stans are obsessive fans who stand for their favorite artist no matter what they do. A Stan will hear that their favorite artist committed the most heinous act and still say, “but the music is above all this”. The type of blind love that comes with the term would scare me, but I think that it makes 6lack’s point really well. From Unfair” to “Stan”, there is some turmoil, but in the end the love that comes from finding yourself and connecting with the right person can be obsessive, in a positive way. Love is unfair. When we’re young, we shoot it around like a loaded gun, we hurt those we “love” and apologize. We see ourselves and our fears in our partners and disconnect, sometimes try and empathize, but when we start to reveal ourselves and open up, our defenses come up in braggadocious way. It takes time, but when the ego comes in, we eventually remember what grounds us and attempt to stay humble. We relax, we calm down, and only then can we give ourselves to someone without losing everything. If that all made sense, understand that I got it from listening to the album carefully. If it didn’t, trust me when I say 6lack took 14 tracks and managed to express the complexity of love in a way that everyone and anyone could appreciate.